NEED A PAIN FREE BREAST LIFT IN AN INSTANT? Our "Bring It Up Instant Breast Lift Tape" will enhances your body image while giving you a "lift" up to six inches! The tape repositions the breast into a higher (think flattering) position, giving you a more youthful appearance. Bright It Up Lifts are applied to the top of the breast, not underneath. They are an invisible, waterproof, hypoallergenic adhesive unlike any other breast lift ever seen before. 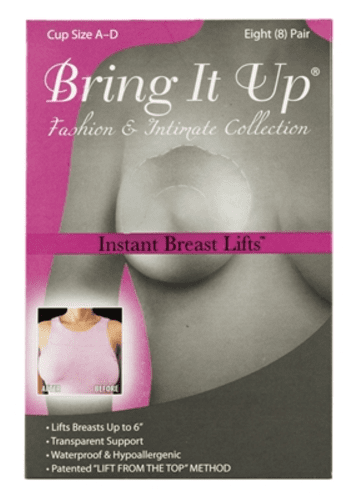 These breast lifts will provide full support, without a bra, up to a size D cup. For larger breasted women over a size D cup, they can be worn with a bra for added support. Great with swimsuits, backless and strapless fashions and are virtually undetectable.